How Does Arthrostim® Adjusting Work? Instrument adjusting has become the fastest growing form of chiropractic manipulation due to its ease of use for the chiropractic practitioner and the safety to the patient. What instruments have to offer is that they can assist a practitioner’s skilled hands to deliver beneficial mechanical forces that would be difficult, or impossible, to produce on their own. 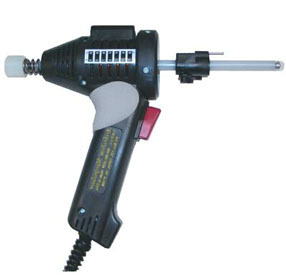 The Arthrostim® has an appearance similar to a drill and is held in a similar manner. It produces a speedy thrust and recoil motion, similar to the way a chiropractor uses their hands to adjust the vertebrae in your back. In fact, it can produce 12 thrusts per second! This helps to reduce the amount of peak force that would be required to adjust a vertebral segment using a single thrust. This can be a great advantage for working with clients who are sensitive or in pain. The force of the thrust radiates through the joint and the tissues that surround it, releasing trigger points that are often the cause of muscle spasms. The input created by the ArthroStim® produces a barrage of afferent impulses, which the central nervous system can use to update its ‘neural image’ of target areas. By utilizing the same mechanisms that the nervous system naturally uses to control biomechanics, corrections can be achieved using reduced forces. It is a gentle, safe, mechanical method of easing the joints back into alignment. It can exert just the right amount of pressure needed for the adjustment, and it works on a wide range of body areas, not only on the spine.